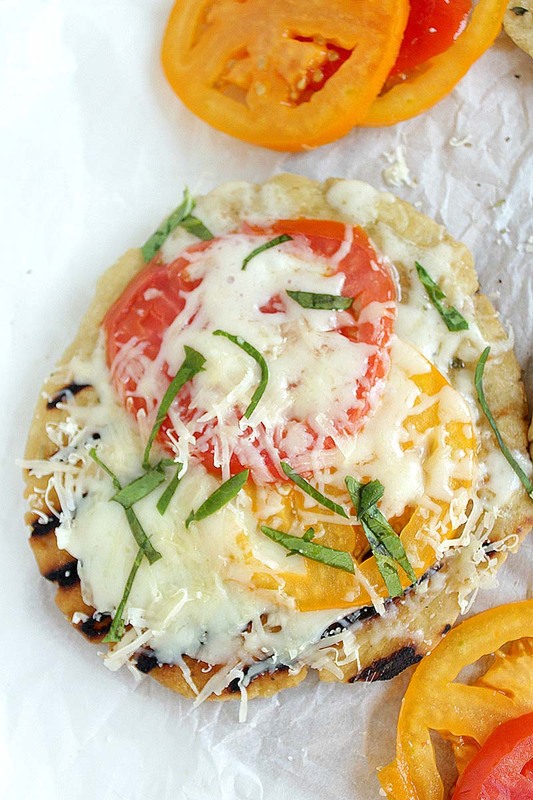 This grilled gluten free flatbread is simple and makes the perfect base for any summer toppings. In a large bowl whisk together yeast, water and pinch of sugar. Let sit 5 minutes, or until foamy. Add in olive oil, flour, cornstarch, xanthan gum and salt. Stir with wooden spoon until a small ball forms. Cover and set in a warm area for 30 minutes. Preheat grill to medium-high heat (about 400°F). Divide dough into 4 equal pieces. Using two sheets of parchment paper place one piece of dough between them and roll out to thin round disk, about ½-inch thick. Brush both sides with olive oil and place on grill. Cook about 4 minutes on each side. Remove from grill and sprinkle with ¼ tsp Italian seasoning. Top with desired toppings and place back on grill for about 3 minutes. OMG! My mouth was watering the whole time scrolling… Need to make this immediately!